On this page, 3c More Scheduling, we finalize planning the project schedule by calculating concrete dates, total float, critical path, and free float of the project. (1) When can we finish earliest? (2) When do we have to start the project latest? The calculations for answering those two questions, we call forward pass and backward pass. As a by-product of these calculations, we also obtain total float and free float of each work package and the critical path of the project. Here is a small example that shows how it works. Basis of the calculations is the network diagram. Each work package contains the following information. 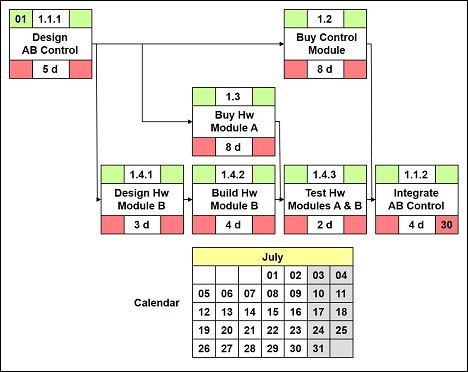 Earliest start date of that project is July 01 (put into the "earliest start date field" of the first work package 1.1.1 "Design AB Control"), latest end date is July 30 (put into the "latest end date field" of the last work package 1.1.2 "Integrate AB Control"). To do these calculations manually for smaller examples gives you the opportunity to understand how most project management software tools work similarly in the background. Let us try. Total float (TF) of a work package is the duration by which we can delay that work package without delaying the project. In our example, total float of work package 1.3 is 3 days, for 1.2 total float is 5 days, etc. We calculate total float of a work package as difference between latest end date (led) and earliest end date (eed) of that work package. The path through the project, from its beginning to its end, along which all the work packages have minimum total float, we call the critical path of that project. The critical path is the path with the longest total duration. In our example, the critical path is 1.1.1 - 1.3 - 1.4.3 - 1.1.2; these four work packages have total float of 3 days each (all other work packages have higher total float), that path has total duration of 19 days (all other paths have shorter durations). Free float (FF) of a work package is the duration by which we can delay that work package without delaying the logically next work package. In our example, work package 1.2 has free float of 2 days, 1.4.2 has free float of 1 day, 1.3 has free float of 0, etc. Here is a graphical summary of all the results. We indicated the critical path in red color. This concludes planning the project schedule.